No matter how fastidious and clean you are around the home, dirt, dust and odors are going to show up. These small-time pollutants are more than just gross, they can aggravate allergies, make the air uncomfortable or leave the ground and other surfaces gritty. Luckily, there are a number of air quality appliances out there that can help you improve the breathability and comfort level in your home. Consider these three major helpers. As anyone who's lived in a wet, hot region knows, when the humidity index is high, personal comfort is low. While moisture in the air can have its advantages – too little in the winter can lead to a variety of problems – while an excessive amount makes a home feel sticky, damp and uncomfortable. Excessive humidity also leads to trouble with respiratory health conditions, such as asthma or allergies. In fact, excessive humidity can even be damaging to your home and belongings themselves: books can come unglued in moisture-rich air, electronics can malfunction and wood can warp. Perhaps worst of all, humidity facilitates the growth of mold in the home, which can lead to a number of health hazards. Luckily, dehumidifiers mitigate all these problems. These appliances use a fan to draw air over cooling elements to remove moisture. The condensation – taken right from the air, then drips down the cool coil elements into a container at the bottom of the dehumidifier. These appliances are often differentiated based on their condensation capacity and how much water they take out of the air over the course of 24 hours. For instance, a 25 pint capacity unit can and will absorb that much water before requiring emptying. The larger or wetter the space that requires dehumidifying, the more capacity you'll need. Dehumidifiers have some basic features you don't want to miss out on. An auto-off function helps the unit conserve power when it recognizes that moisture levels are lower. Reusable air filters can be washed at home, saving you money in the long run. A fan with adjustable speeds will help your dehumidifier dry a room more or less quickly. And portability is also important, depending on how many rooms you'll be using the unit in. Of course, the most essential feature may turn out to be the condensation tank itself. 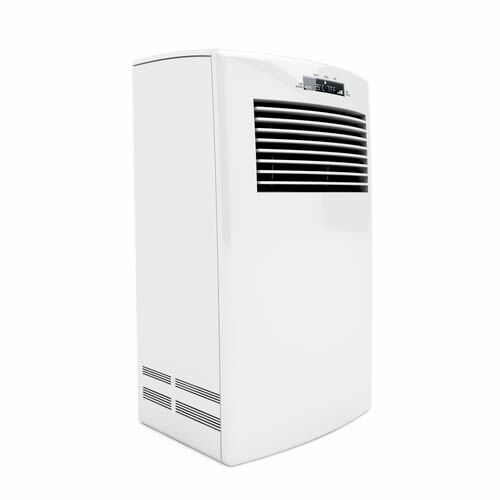 Larger units can be heavy, so the more ergonomic it is to empty a dehumidifier tank the better. These products can help you get rid of bad odors, unwanted dust, mold particles and all that pollen floating around inside your home. Believe it or not, your house can be pretty polluted – but luckily, a designer air purifier can make all the difference. These appliances circulate the air in a room, using internal fans to pull air through a filter and release it back into your home. The hazardous or irritating particles get caught up in the filter and are removed from your space. Air purifiers are often listed for square footage, so you'll know exactly how large a space your appliance will work in. Terms such as Clean Air Delivery Rate (CADR) indicates the actual volume of filtered air your unit delivers – so the higher this number the better. While the Air Changes per Hour (ACH) indicates the number of time a room's full air volume – determined by square footage – will pass through the filter. When looking for air purifier features, there are a couple must-haves: Multi-speed fans give you more control over the rate of purification, while oscillating purifiers create improved air circulation thanks to swivel technology. Invest in a model that's quiet – or, if you prefer a little white noise, like a traditional fan, find a unit offering that. For many folks, one of the most important features however will be energy efficiency. Look for models that you can run reliably but won't send your utility bills skyrocketing. When it comes to picking the right vacuum cleaner for air quality, there's one factor that's most important: High Efficiency Particulate Air (HEPA) filters. A HEPA-sealed system in your vacuum ensures that what comes in – even the smallest particles of dust, dirt and mold – won't get siphoned back out. HEPA filters are an essential tool for homeowners concerned about air quality – especially when it comes to severe allergies. It's important that you invest in a true HEPA filter with a completely sealed airflow system. Standard filtration may clean your floor, but it won't do a lot of good for your air quality.